As house sizes grow ever larger more people find themselves with spare bedrooms in their homes. These bedrooms are often called "guest rooms" by default, even though they're usually just a place where all the extra furniture ends up. When guests do come to stay over, you shouldn't have to worry about cleaning out their room. Ideally, a guest room is low maintenance and includes everything your guest will need to feel comfortable away from home. So, instead of filling the room with the 25 old pillows that have been accumulating in your house, here are some essentials that every guest bedroom should have. Use bright, but calming colors on the walls, put a bedside table with a beverage coaster near the bed, use curtains that can be closed to block out the morning sun or opened to let in as much light as your guest would like. The important thing to remember is to avoid clutter and personal objects. If your guest feels like they're surrounded by junk they won't feel very at home. Similarly, if there are personal items like your photos, notebooks, or clothing in the room they will feel like they're intruding in your space. Instead, keep your personal items in your own bedroom or office and think of the guest room as more of a hotel within your home. We won't discuss the obvious necessities of a bedroom (i.e., beds and beddings). Rather, here are some items you may not have thought to include in your guest room that will make your guest feel more at home. Cell phone charger. Odds are your guest only brought one charger with them. But if you have an iPhone or Android (micro USB) charger ready for use on the bedside table, it will let them keep their own charger in their bag for use outside the house. Wi-Fi name and password. Write the Wi-Fi name and password down on a notepad and place it on the bedside table. This way your guest won't have to worry about disturbing you late at night to remind them of the log-in info. It's also a good idea to leave a pen with the notepad in case your guest wants to leave themselves any notes. Empty storage space. To help your guest feel organized, make sure they can use the closet or dresser to unpack their clothes and belongings and store away their suitcase. Tissues and wastebasket. A common, but overlooked, courtesy to include for your guest is a box of tissues and a wastebasket. Ear plugs. Even if you don't live in a noisy neighborhood there may be some late night sounds that have become white-noise to you but that your guest isn't familiar with (i.e. trains, heating or AC sounds, wildlife). Shower caddy with useful items. You can buy a small shower caddy at the dollar store and fill it with useful items for your guest, such as: soap, shampoo, shower sponge, razors, Q-tips, headache medicine, and band-aids. Your guest can bring this back to their bedroom and won't feel like they're taking up space in the bathroom. Maximizing space in a smaller bedroom and making that room look and feel larger isn’t impossible. These tips wont break the bank or drain months of your time. Here are a few tips to make your small bedroom feel larger: Paint: Use paint colors to your advantage. Light, cool colors and light, cool toned colors are the best for making your room look larger. Use vertical stripes to make your room feel tall. Paint your ceiling a dark color to enhance its larger, taller feel. Furniture: Some pieces of furniture can make your room feel small. Avoid bulky bedframes and instead choose smaller, more delicate looking bedframes. The smaller bedframe will also take up less space in your room. For added perception of extra square footage, leave a few inches of space between your furniture and the wall. It will create the illusion of spaciousness as it makes the room look more open. Wall-Mounted Nightstand: Instead of having bedside tables on each side of the bed, use floating shelves or wall mounted nightstands. It will make the room feel and look more open since more floor space will be seen. Multipurpose Furniture: Storage beds work wonders. They create additional storage without adding any additional furniture. There are storage beds with under the bed storage and headboard storage. Mirrors: Mirrors create the illusion of more space. This could be just by having a larger wall-mounted mirror in the room or adding floor to ceiling mirrors, which will dramatically increase the perception of a larger space. Wall-Mounted Lighting: Having wall-mounted lighting aids in avoiding the issue of clutter on tables and shelves. It will draw the eye up instead of down at cluttered areas. With just a few simple updates and some new furniture you can create the illusion of a larger bedroom. If you are looking to make some smaller updates then start with the cosmetic tips and move onto the larger ones when the time comes. 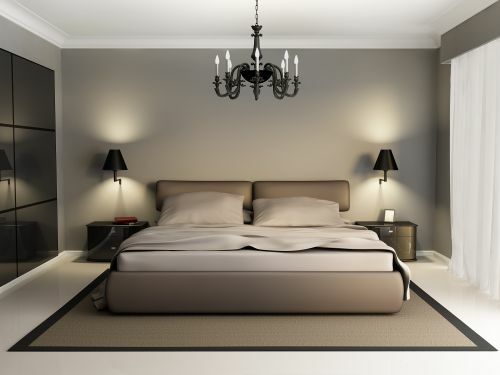 Implementing just one tip will get you on your way to a bedroom with a grander feel.